Trump Will Host China's President Xi Jinping In Florida : The Two-Way Xi Jinping will visit President Trump in Palm Beach, Fla., next week, for talks that will reportedly center on economic and other issues. China's President Xi Jinping will visit President Trump in Palm Beach, Fla., on April 6 and 7. 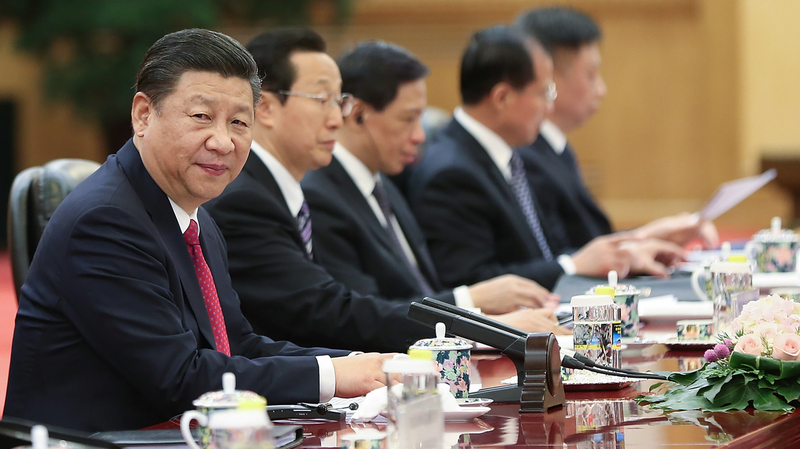 Xi is seen here during meetings in the Great Hall of the People in Beijing earlier this week. A Chinese spokesperson notes that before the visit to Trump's Mar-a-Lago property, Xi will spend three days in Finland. "This shows the importance China attaches to a future-oriented new type of partnership with Finland, and support for the EU," said Foreign Ministry spokesperson Lu Kang, according to state-run Xinhua News. Xi's visit to Florida had been widely assumed, but China and the U.S. are now confirming details that emerged during Secretary of State Rex Tillerson's recent visit to Beijing, in a trip that centered on North Korea's nuclear threat. "China's leadership has become increasingly irritated at being repeatedly told by Washington to rein in North Korea's nuclear and missile programs and by the US decision to install an advanced missile defense system in South Korea. "Beijing is also suspicious of U.S. intentions in Taiwan, which China claims as its own. Trump angered Beijing in December by taking a phone call from the Taiwanese president and calling into question the one-china policy. He later agreed to honor the policy." The White House says Trump and Xi "will discuss global, regional, and bilateral issues of mutual concern." The Chinese spokesperson was a bit more forthcoming, although Lu stuck to economic issues when he stated, "China hopes to make joint efforts with the United States to expand trade cooperation, properly settle trade frictions through dialogues, and maintain healthy and stable growth of trade and economic ties." "The President and the First Lady will also host President Xi and Madame Peng Liyuan at a dinner on the evening of April 6," the White House says. As NPR's Laurel Walmsley reported Wednesday when details about the visit were being confirmed, "The Government Accountability Office announced Tuesday that it will be examining the costs and security issues associated with Trump's frequent visits to Mar-a-Lago. Senate Democrats introduced a bill last week that would call on the president to release logs of visitors to the White House and Trump's private properties, including Mar-a-Lago — information that isn't currently available."